Do descendants of Chicago's Native American tribes live in the city today? Burial stone of Alexander Robinson, also known by the name Chee Chee Pin Quay. From the interior of Indian Boundary Park field house on Chicago's North Side. These photos were taken of present-day Chicagoans with American Indian roots at the American Indian Center of Chicago. “"The area known as "Chicago" used to be an Algonquin area called Shikaakwa. My question is are there any more of the native american Chicagoans left in the city?" So this actually is a tough question to answer in a precise way because there weren’t systematic and reliable counts of the Chicago area’s Native American population for several decades. But before we get to that, it’s worth noting what things were like when non-native settlers first came to the area. 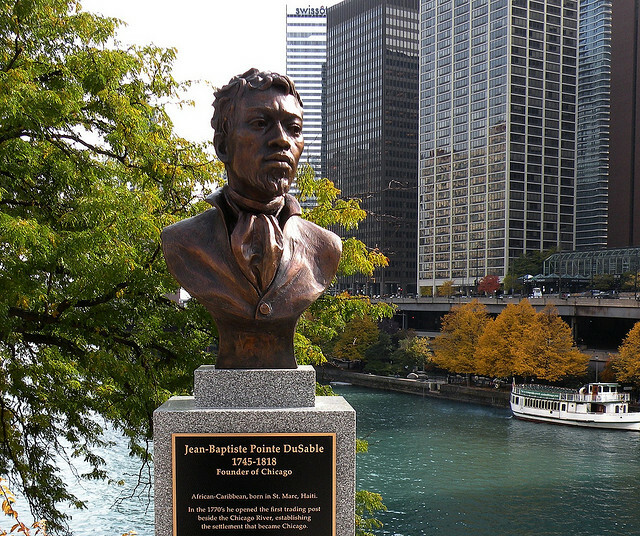 Jean Baptiste Point DuSable is considered the first permanent resident of Chicago, a Haitian-born immigrant to Illinois. DuSable’s wife, Kittahawa, or Catherine, was Potawatomie Indian, and the couple settled at the mouth of the Chicago River around 1790. Low says between 25 and 30 tribes might claim the Chicago area as part of their ancestral lands. The dominant tribes at that time were the Potawatomie, Ojibwa and Odawa. But there were others, too, such as the Menominee, Miami and Ho-Chunk. So, how about that name? An interesting sidenote on this: The word “Chicago” is believed to have come from an Algonquin word. When I was looking this up, I found that some people had been inquiring about the root of the word much earlier! The gist, according to an 1879 account by a Mr. W.H. Wells, is that “The original meaning of the word Chicago is skunk.” Low says more recent scholarship debunks Wells’ conclusion. He says research indicates that the name, in reference to this place, was tied more to the smell of plants in the marshy area, thought to be wild onions or leeks. “If you have a strong imagination, you could imagine that they sort of smell like a skunk,“ says Low. But back to Gerard Fleming’s question of what happened to those early Native Americans in Chicago. Between the 1790s and the 1830s, the U.S. government negotiated several treaties with the tribes in the Great Lakes region that ultimately pushed most of them west of the Mississippi River. For the most part, the plan was effective — particularly with the Treaty of Chicago in 1833. Most of the tribes ceded all that remained of their lands in Chicago and agreed to move to reservations to the west. However, some remained. For example, Alexander Robinson, also known by the name Chee Chee Pin Quay, was able to remain on land that was granted to him by the U.S. government in return for his assistance in negotiating a treaty with the Native Americans. Robinson, a half-Scottish and half-Native American businessman, was a chief of the Potawatomie, Odawa and Ojibwe. His children and grandchildren continued to live on that land until the 1950s. He still has direct descendants that live in the Chicago area. There may have been others who never left, but they likely kept their heads down, says Joseph Standing Bear Schranz, of the Midwest SOARRING Foundation. On top of that, the U.S. Census wasn’t picking up on the Native American population for several reasons. Since they weren’t U.S. citizens — and they weren’t paying taxes — the first six censuses (starting in 1790) excluded them. In 1860 some Native Americans started to be counted, but only if they were considered “assimilated.” It wasn’t until 1890 that the U.S. Census tried in earnest to document the number of Native Americans. But Schranz says they continue to be undercounted. The 2010 Census puts about 101,000 American Indians and Alaska Natives in Illinois, and about 27,000 in the city of Chicago. According to Joe Podlasek, Executive Director of the American Indian Center in Chicago’s Uptown neighborhood, the greater Chicago area has the third-largest off-reservation population of Native Americans in the country. Many of them, or their predecessors, came back starting in the 1950s, when the federal government began its Urban Indian Relocation Program. 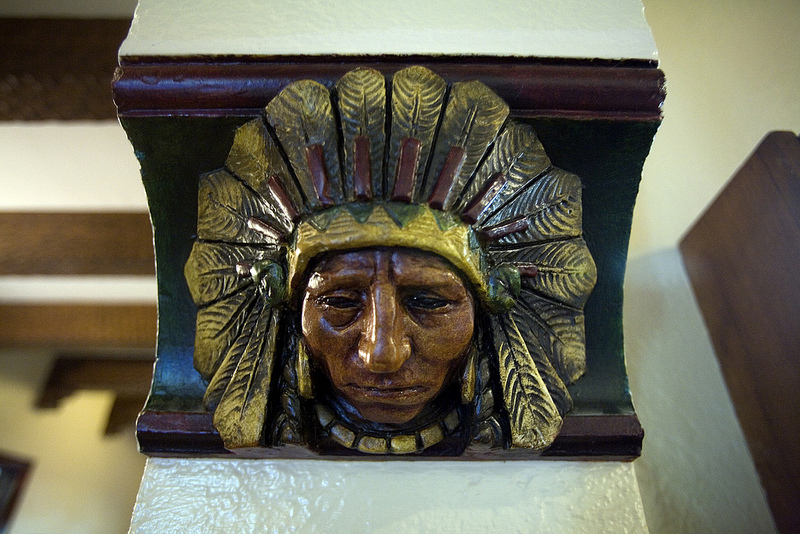 Schranz says that most of those who claim ancestral roots here are probably from lines that went away for a while and then returned in recent decades. Another interesting note is that, while much of Chicago’s Native American history seems to have been swept under the rug, there have been occasional attempts by descendants of those lines to reassert their land rights. As early as 1914, some Michigan Potawatomies sued in federal court to reclaim the strip of land between Michigan Avenue and the lakefront. They said when they signed the Treaty of 1833, they ceded the land west of Lake Michigan; however, after the Great Chicago Fire, rubble was used as landfill, extending the shoreline east to areas that the tribe had not given up. They lost their case. In 2006, the Prairie Band Potawatomie, who live on a reservation in Kansas, purchased a farm about 70 miles west of Chicago, in Shabbona, Illinois. They claim that is part of their ancestral lands. 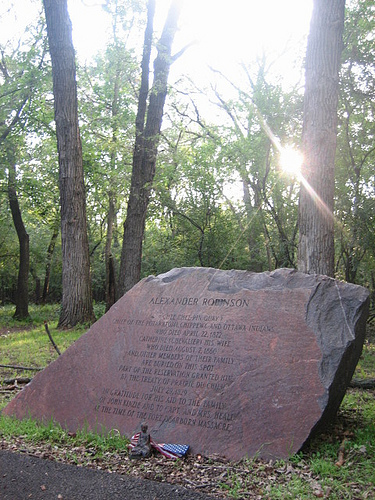 And just a couple of years ago, descendants of Alexander Robinson, a part-Odawa, part-Scottish businessman who was chief of the Potawatomie, Odawa and Ojibwa, began speaking publicly about their claim to parts of the Cook County Forest Preserve. The land had been granted to Robinson by federal treaty in the 1820s, and it could not be conveyed to any new owner without the signature of the President of the United States. Some of his descendants claim that the land was taken without such authorization.